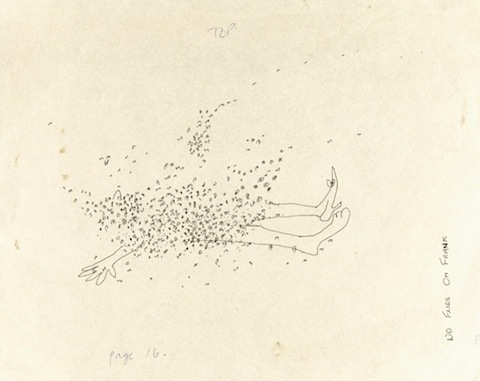 Upon his tragic early death at 40, John Lennon left behind a body of work few popular artists could hope to equal. And that’s only the published stuff. 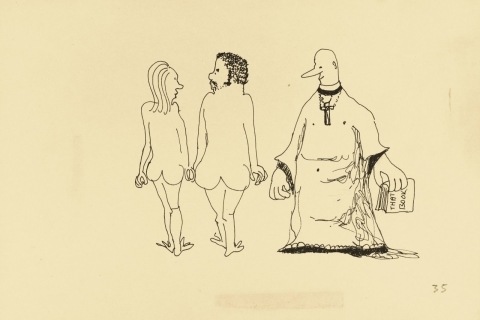 As we pointed out in a recent post on his home demos, the former Beatle also left hundreds of hours of tape recordings for his fans to sift through, and, as if that weren’t enough, Sotheby’s recently auctioned off a storehouse of original manuscripts and autographed drawings for two books Lennon wrote in the mid-sixties, In His Own Write (1964) and A Spaniard in the Works (1965), a Sherlock Holmes parody. I was bored on the 9th of Octover 1940 when, I believe, the Nasties were still booming us led by Madolf Heatlump (who only had one). Anyway they didn't get me. I attended to varicous schools in Liddypol. And still didn't pass -- much to my Aunties supplies. As a member of the most publified Beatles my (P, G, and R's) records might seem funnier to some of you than this book, but as far as I'm conceived this correction of short writty is the most wonderfoul larf I've every ready. 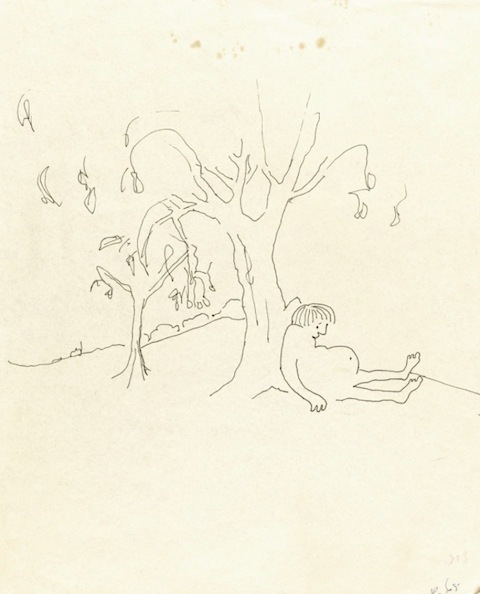 Recalling the artwork in Silverstein’s The Giving Tree, directly above we have a simple illustration for a poem called “I Sat Belonely,” captioned with the poem’s first two lines: “I Sat Belonely Down a Tree, Humbled Fat and Small” (read the full poem here). 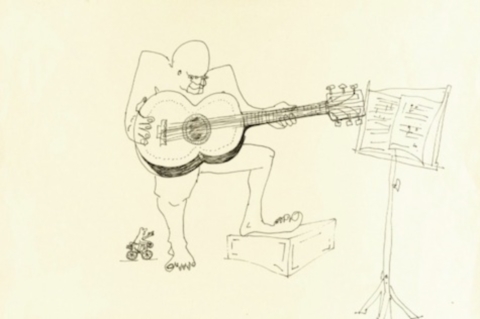 Just above, Lennon sketches a Picasso-like four-eyed guitarist in this untitled drawing (notice the tiny cyclist at his feet)---estimated by Sotheby’s between $15,000 and $25,000. 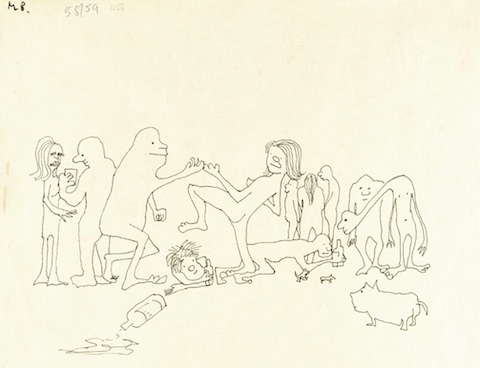 The eighty nine lots that went up for auction included many other drawings (see more here) and some handwritten notes from Paul McCartney. All told, the sale netted close to $3 million, though for Lennon devotees, these artifacts are priceless. Learn more about the sale at The Guardian.